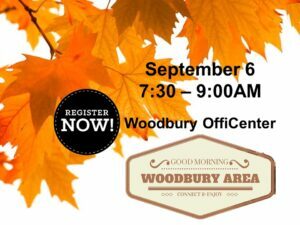 We're excited to host our first Good Morning Woodbury networking event on Thursday, September 6 from 7:30-9AM at Woodury OffiCenter! Join us for coffee, light breakfast and to connect with other chamber & community members on your way to work! Format is open house, with a short program at 8:45am. Free and Open to Everyone! Register NOW!